They run their scams out of apartments, and sell a few dozens or a few hundred bottles per year. They don't have a factory and couldn't afford standardization anyway. We at Sumatra Pasak Bumi do not standardize tongkat ali extract. And it's not because we wouldn't be dedicated to quality. It's because we do not believe in lying to and cheating customers. We have been in the tongkat ali trade for more than 25 years, and as a company, we have the intention to span several generations. With such a perspective, we don't join marketing fads that come and go. Sumatra Pasak Bumi manufactures tongkat ali extracts at two ratios, 1:50 and 1:200. The two ratios refer to the number of kilograms of root in relation to one kilogram of extract. It's something we can measure fairly easily with a normal 7 scale. In the past two years, many websites selling inferior or outright fake tongkat ali have suddenly come up with claims of standardization. 2 percent, 4 percent, 8 percent, 20 percent eurycomanone. The eurycomanone content of 1 kg of dried tongkat ali root lies in a natural range of in between 0.1 and 0.5 grams. The percentage in large roots is typically higher than in young or small roots. Using an extraction method of heat and pressure over a certain period of time, one can arrive at extracts that contain between 0.5 and 2 percent of eurycomanone. To standardize an extract for eurycomanone sounds easy on the paper of labels, and the claim can be worded on websites in a matter of seconds. But in real life, things are not so simple. If standardization would be done in accordance to international lab rules, first one would have to establish the exact natural occurence of eurycomanone in any given lot of tongkat ali extract. This requires a chromatograph and time. Then, if the measured eurycomanone is below what one wants to print truefully on a label, additional eurycomanone would have to be added. There is no other way. To manufacture pure eurycomanone, it has to be separated from other consituents through a variety of chemical processes. A method to isolate eurycomanone on an industrial scale, as it is possible for yohimbine or caffeine, doesn't currently exist. So it needs filtering, centrifuging, dissolving, and chemical reagents. Therefore, pure eurycomanone is really expensive. This is reagent grade. Not pharmaceutical grade, and not even food grade. Ethics guidelines in many countries would not even allow the substance for tests on life animals. Chemical supply houses don't sell to just anybody. You have to send credentials, such as proof that you are a researcher at a university. Anyway, if it were available, pure pharmaceutical grade eurycomanone would have to be added in an ever variable proportion to any tongkat ali extract to make it standardized. That would be a huge effort, at astronomic costs. A high potency extract has maybe 2 percent eurycomanone. For a 300 mg capsule, this would be approximately 6 mg. If a product were 300 mg per capsule, and 8 percent eurycomanone, than at least 18 mg of pure eurycomanone would have to be added, at a cost of 18 x 1520 US dollar = 27,360 US dollar per capsule. Times 100 capsules = 2,736,000 US dollars, just for the standardization of 1 bottle. And then the scammers offer it at 69 dollars per bottle, buy 2, get 1 free. Ridiculous. 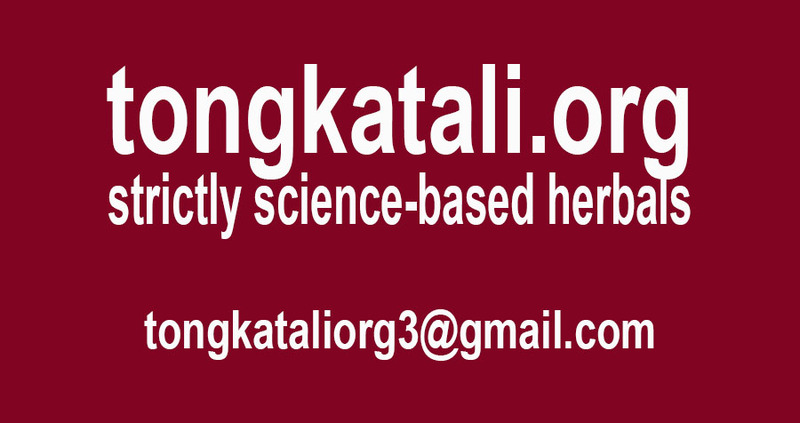 Every website claiming "standardized" tongkat ali extract is a scam. And why should those scammers bother even with just genuine tongkat ali when, as a matter of fact, they can ship sawdust, or all-purpose flour, and still print "standardized tongkat ali" on labels, or include the claim on a web page. Nobody will or can check.